It was safe to say, once I'd dabbled with Fudge's Paintbox colours, I got the colour bug. In that post I spoke about how much I wanted hair like My Little Pony, and I'd toyed with the idea of bleaching my whole hair in order to get a whole head of pink. 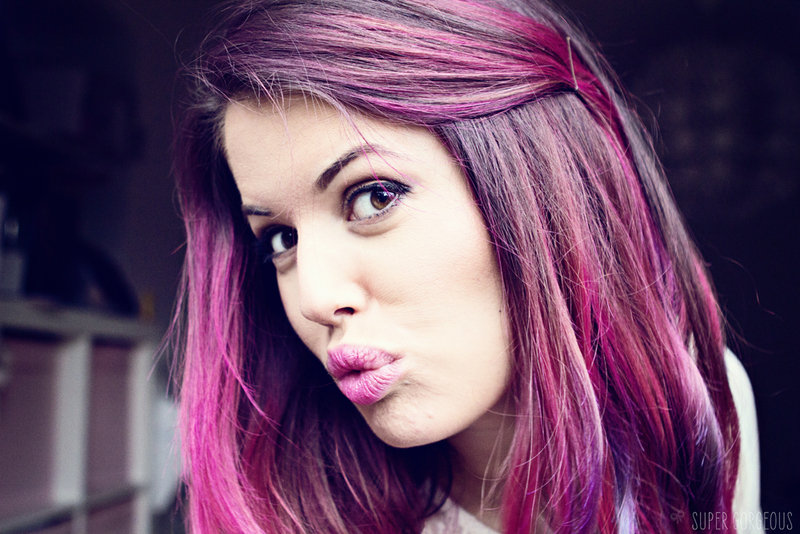 I loved the pink hair so much that I decided I was going to go for the kill and do my whole head. 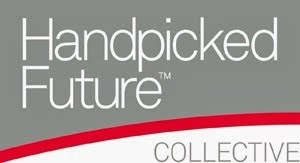 I knew I needed to go somewhere amazing who knew what they were doing - BLEACH London were the first people I thought of. All the session stylists I work with rave about it, and it's well known that if you want a crazy colour in London, BLEACH is the place to go. 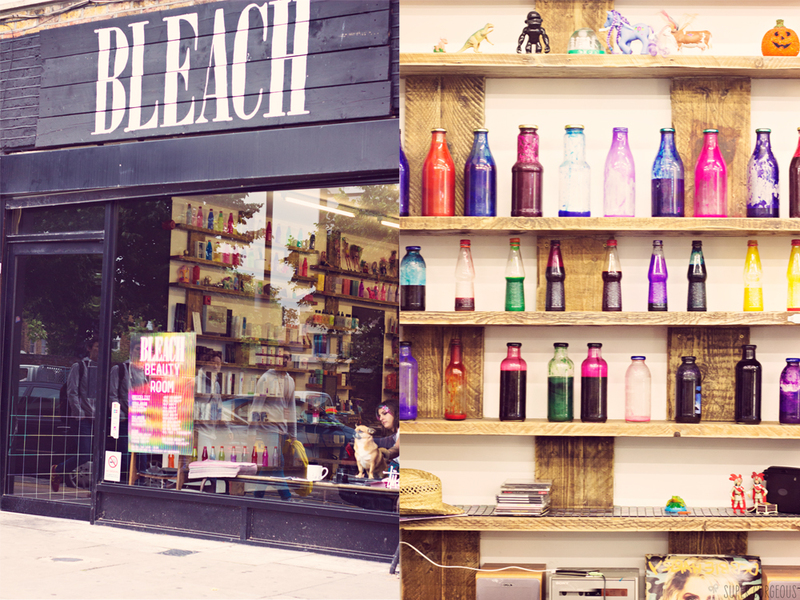 BLEACH has recently opened a concession in Topshop Oxford Circus, but I visited their original Dalston salon to get my pink-on. It's based in the heart of East London, slotting in nicely with the local vibe. The salon is lined with glass bottles, once holding soft drinks, now where the magic dye is kept. The colourists mix up their own potions and tones at the back from the nameless containers. Very mysterious and so very cool. I spoke to Sapphire, the manager, and also the lovely lady that would be doing my hair, about what I wanted. I have so much hair, that is very thick, and I use straigheners almost every time I wash my hair - all these factors were working against me in my quest for a full head of pink locks. She advised me that my hair would snap off, and would be very coarse... it was all of a sudden sounding less appealing! I was disappointed that I couldn't have the hair I had envisioned, but at the same time I was grateful that Sapphire was professional enough to notice the warning signs to stop me from ending up with a rubbish head of hair! She said she could take my blonde up a little further, giving me more area for the pink to work with - but when I thought about how that might look once I'd decided I had enough of the pink, I decided against it. Although now, I'm kind of wishing I did it! In the end I went for, what they call, a 'Super Cool Colour', and boy, is it super cool! I had seen an image of a girl with pastel pink hair, with turquoise and purple running through the ends that I was using as hairspiration. I showed it to Sapphire who said that my hair probably wouldn't go those tones as it wasn't quite blonde enough, but she could make it quite strong, which would eventually fade down to a more pastel version of itself. I was sold. 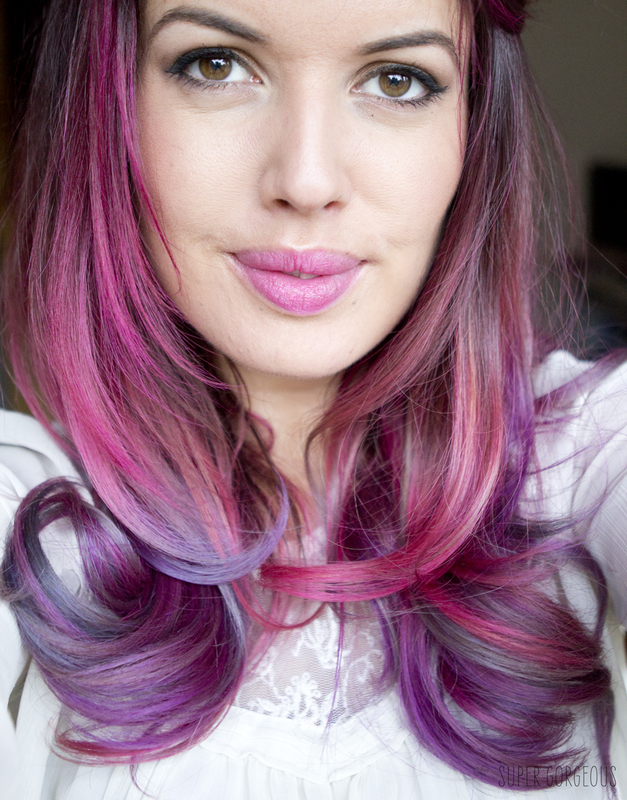 She took her time thoroughly coating all of my hair, and blending the purple and blue into the ends. It was a much better than what I'd managed when I did my own dye job a few weeks previously! It was left for 20 minutes before being rinsed and I actually said "wow" as I saw it being dried. I was in love. The only problem is, now I really really want a whole head of it! Wow! It looks amazing and I have TOTAL hair envy! Stunning!! I love it! I think you have embraced colour but in a really tasteful way. I've actually not seen anything like this despite being a regular in East London. 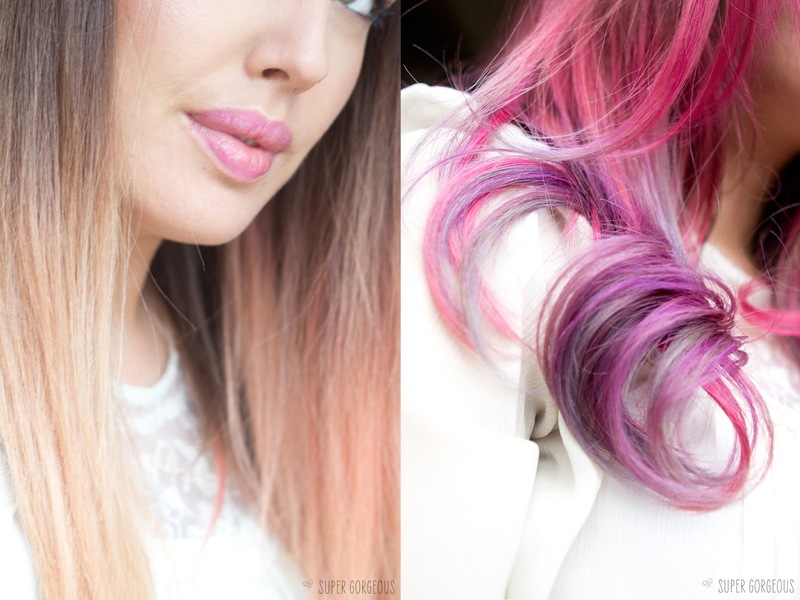 All the colourful tresses I have seen have looked whispy and like straw your hair looks so healthy! Wow, that is seriously stunning! Damn that is seriously amazing! I want to go auburn at some point and these guys look like they are the people to go to if I'm in London at some point! wow! 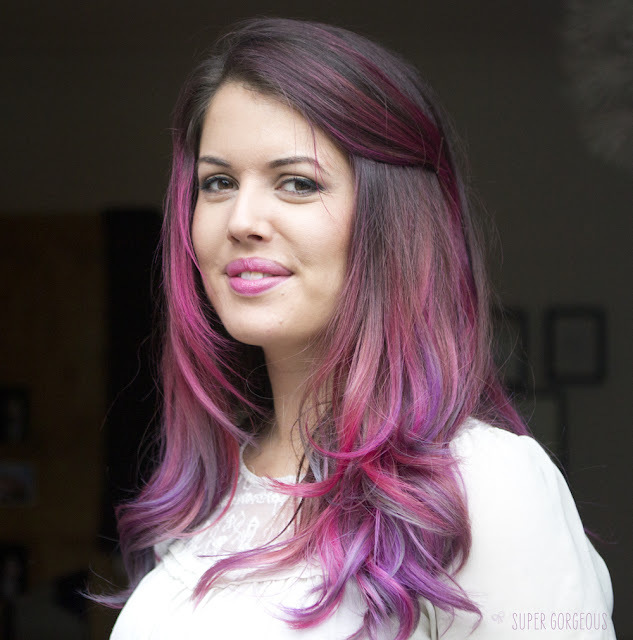 i have total hair envy!! Oh dude this is so awesome! I AM IN LOVE WITH YOUR HAIR. 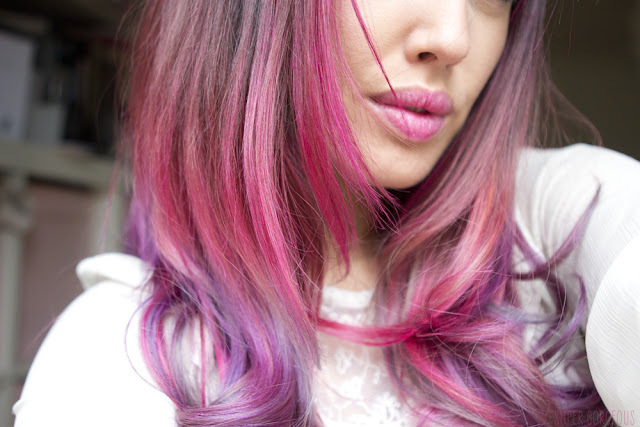 I am dip dyeing mine this weekend so I can achieve pink ombre for Reading fest, which will probably look horrific with my red hair but I seriously don't care. This looks SO amazing on you! This looks so good! Amazing!! 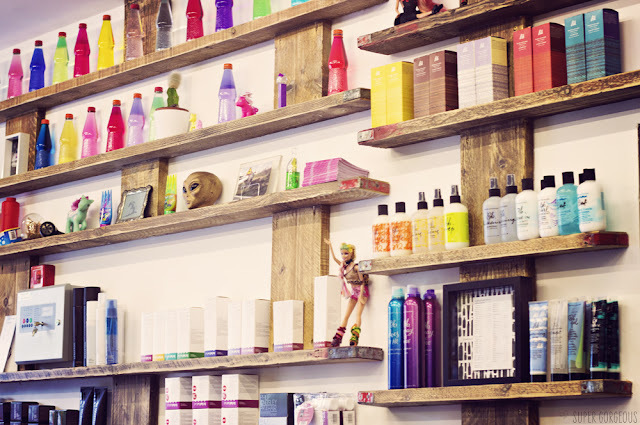 how did you go aboutt getting your appointment at the dalston location? is it true that you need a referal or invitation?